How can you maximize the efficiency of these headings? Read on to learn the latest news on creating Google- and user-friendly headings. An H1 tag is critical. The heading acts as an information guide for the search engine bots. It should include a highly searched keyword. While some may think the H1 tag should be at the top of the content, it can be placed anywhere within <body>…</body> container. Always include an H1 tag. Use only one per page. Include the primary keyword for your content. Avoid populating the tag with too many keywords. Ensure that your target audience can easily read the H1 tag. Use up to 70 characters in the tag length. Use the highest volume and critical keywords in the title tag. Use the next most important keywords in the H1 tag. To improve the process of selecting keywords to optimize headings, services such as Ahrefs, Serpstat (my employer), or SEMrush can be helpful. Consider creating a table of keywords to support your heading writers. As with the H1 tag, you can place H2, H3, and other heading tags anywhere in the body of the content. However, hierarchy is critical. Be sure to use Hx tags in logical order within each section of content, such as this hypothetical example of an article about making pancakes and sausage. H4, H5, and H6 tags are used less frequently. They are useful for breaking up content in long reads. 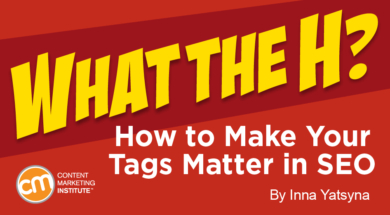 Be careful about using too many H tags, as that could be interpreted as spammy and decrease the value of all the headings in the eyes of search engines. Google treats such content as less informative. Write brief, well-articulated H2 through H6 tags. Don’t use links in heading tags unless you want to take readers away from your content. That (the order) doesn’t really matter. 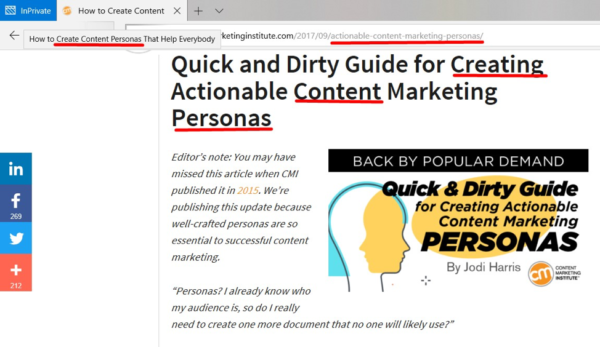 We use the headings to understand the context of the content on the page a little bit better and for that, we don’t need a strict order of the heading tags. Don’t forget about hierarchy <h1> through <h6> (though Google currently claims it’s not of top importance, it’s important to illustrate proper flow for readers). Apply keywords within headings based on their search volume. Keep headings brief and to the point. Clear styles and format headings within the CMS to avoid unexpected/extra symbols within the tags. Do you have additional tips for creating SEO-friendly headings that convert and meet the target audience? Please share them in the comments below. You still have time to join us in San Diego for ContentTECH April 8-10. Use code BLOG100 to save $100. Register today.